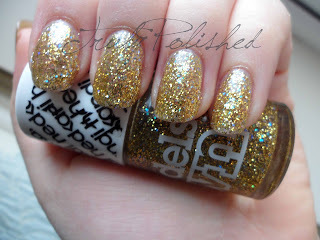 Disco Heaven is a gold glitter with a twist. 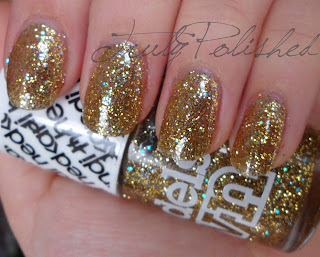 Originally I thought it was gong to be like Gold Finger, Models Own's standard gold glitter but this is so much more! It has turquoise and purple glitter in it too with the odd bit of holo glitter, so it really is totally different to every other gold glitter I've ever seen. This polish goes on really well for a glitter. I left a few minutes between each coat until it was totally dry and I didn't get any dragging. One coat is enough to layer, but my photos show two, three and eventually four coats which gave me enough opacity. Blurred to see the glitter better! I love how this polish looks when it's opaque. My boyfriend said it looked over the top, but I think I'd wear it again even if it was only for a night out! If you're only planning on buying one polish from the HedKandi collection then at the moment this is my pick. But let's see if I still feel the same way after I FINALLY get my hands on Ibiza Mix! You can buy this in your local Boots (depending on stock...) or alternatively here on the Models Own site where it retails for £5.